All religions could contain truth. Christians should hopefully be willing to admit this point, and should go even further to help point out common points of belief with the various religions of the world. However, if a person asks this question, he or she generally intends to say that if there are aspects of truth found within each religion, then every religion must then be accepted as being equally valid and true. The problem with this line of thinking is that religions come not in isolated teachings or beliefs, but in systems of doctrines that form a complete faith. For example, a recipe for a casserole might call for ten ingredients. If three people use this recipe, but one cook only uses eight of the called for ingredients and replaces the other two with something of his liking, and the second cook only uses six ingredients total from the recipe, and the third chef uses all ten ingredients but doesn’t make a casserole, but instead makes a stir-fry, did any of them make the recipe’s casserole correctly? No, none of the cooks made the casserole correctly based on the recipe, yet all of their meals contained ingredients from that recipe. Similarly, if religions contain aspects of truth, it doesn’t mean that they are true in their entirety. They each would just contain elements of truth, but as a complete system of doctrine would be false. If one religion was true in its entirety, then it would be true, while all other religions would be false and only contain aspects of the truth. What about the elephant parable? 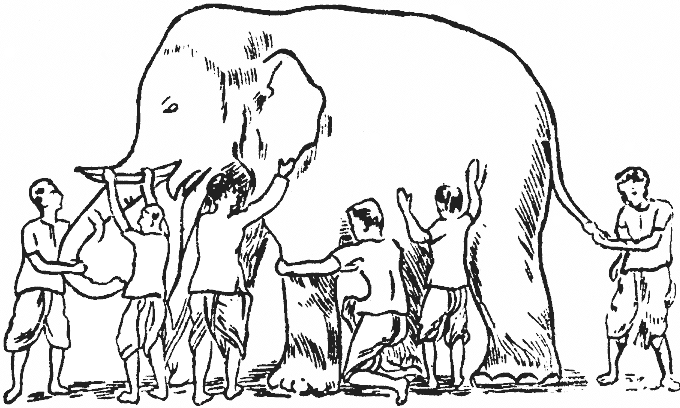 A common parable used in this discussion of religious truth is an Indian legend about six blind men touching an elephant. All the blind men touch a different part of the elephant and come to a different conclusion about what they are all touching. For example, one of them touches the tail and thinks the elephant is like a rope. Another one touches his leg and thinks he is touching a tree. The next blind man touches the elephant’s side and concludes that the elephant must be like a wall. The story continues as the three other blind men come to different conclusions about the elephant based on their experience of what they have touched on the elephant. This parable is used to illustrate that we as humans are like the blind men who do not have the proper sight required to comprehend ultimate reality; it’s just beyond our capabilities. However, all of us have touched and experience reality and have come to accurate conclusions based on what we have experienced and known. This would mean that all of the world’s religions are equally fair assessments of the truth and therefore are all equally valid paths to articulating the sacred. It could even be taken to another step to say that by embracing all religions as true, then a person would have an even more accurate understanding of what ultimate reality is. The original telling of this legend has a king who sees the blind men groping at the elephant arguing about what they are touching. The king reveals to them in laughter that they are all foolish men that the same reality, the elephant! This is very interesting that the original legend has a word from above revealing the truth to the blind men. This indicates that the truth is actually discernible – we might just need some help from someone up above. Do you want to be saved or don’t you? There is one true religion. No angles.